The Federal Reserve’s decision to finally begin its long awaited monetary tightening cycle by hiking its benchmark interest rate in December. The overnight interest rate target was increased to 0.5% and has already seen the US Dollar trade around near 13-year highs. Global oil prices fell to a 12-year low, below $30 a barrel in January, an astonishing 70% down in the past 18 months. This has caused a sharp sell-off among currencies of oil-dependent countries and prevented any pick-up in inflation. Concerns of a slowdown in China, and the sharp devaluation of CNY in January, has sent many emerging market currencies lower, particularly those dependent on trade flows with China. Generally, we think the brutal sell-off in emerging market currencies has been an overreaction. Interest rate hikes in the US will happen at a very slow pace and the ECB has all but guaranteed that further monetary easing will be announced at their March meeting. So whatever liquidity is withdrawn by the Fed, will be more than made up by the European Central Bank. 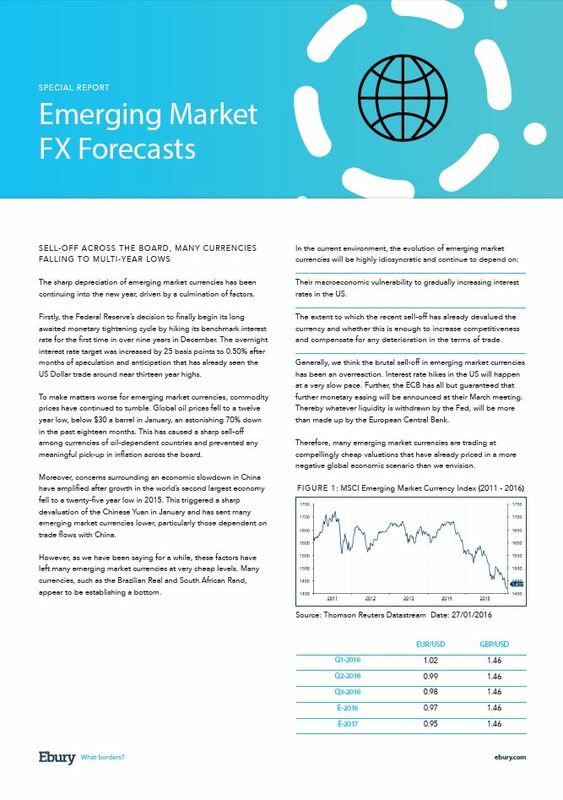 Therefore, many emerging market currencies are trading at compellingly cheap valuations that have already priced in a more negative global economic scenario than we envision. Many UK businesses have already been taking advantage of these cheap levels to lock in their exchange rates at a favourable level. This also allows them to protect their business from any further volatility. To discuss your currency exposure and how to set up an effective risk management strategy, contact us today.